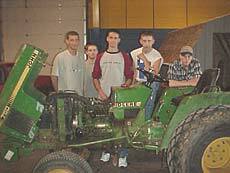 [MAY 4, 2001] Five members of the Hartsburg-Emden FFA chapter placed at the recent Section 14 Agricultural Mechanics Contest. Nic Coers placed first in carpentry skills, Kory Leesman was second in engine analysis, Matt Duckworth was third in surveying, Shawn Payne placed third in electrical wiring, and Kevin Behrends participated in the welding skills area. By placing first in his area, Nic Coers will now advance to the state agriculture mechanics contest. Each individual took a written test and then had to do a hands-on practicum in his respective area. [MAY 1, 2001] The Hartsburg-Emden FFA livestock judging team placed third at the recent Section 14 Livestock Judging Contest. Matt Ballance was fourth-highest individual overall and third high in swine judging. Other members of the team were Matt Duckworth, Nic Coers, Matt Wrage, Daniel Coers, Brittney Kavanaugh, Kory Leesman, Josh Anderson and Jacob Klokkenga. 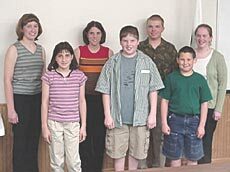 [APRIL 28, 2001] Logan County 4-H had its annual Oral Communications Contest recently. Illinois State Fair delegates selected included Emily Bakken, Lincoln, illustrated speech; Hans Bishop, Atlanta, illustrated speech; Amanda Davison, Beason, formal speech; Andrew Fulton, Lincoln, illustrated speech; Mathew Runyon, Broadwell, demonstration; and Abrigail Sasse, Beason, original works. Selected as an alternate was Kelly Cross, Hartsburg, in oral interpretation. All were Blue Award winners. Abrigail Sasse was selected as the top oral communicator and received a plaque sponsored by Lincoln IGA. Judges for this year's contests were Christina Wilkinson of Springfield and Jo Ellen Maske of Mount Pulaski. 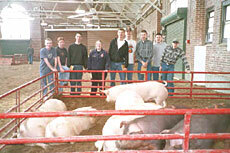 [APRIL 24, 2001] Logan County 4-H members participated in the area 4-H Meats Judging Contest April 19 at RMH Foods in Morton. Members of the local team were Troy Tolan, Andrew Fulton, Rachael Jones, David Fulton and Daniel Fulton. All were in the junior category of under 14 years of age. The team placed third in the Junior Division. Individuals placing in the junior bracket were Andrew Fulton, placing third, and Troy Tolan, placing fourth. The team was coached by Don Miller from the Logan County Extension Office. 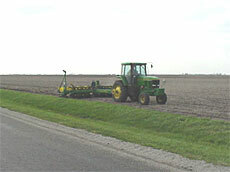 [APRIL 23, 2001] Logan County farmers are finally getting to roll in earnest on a countywide basis. Earlier, there was quite a bit of field activity in the southern portion of the county, but producers in the northern half were at a standstill in many instances. It’s always hard to estimate planting percentages when some are done planting and others haven’t started, but the 50 percent level should come close for our corn acres. This lags behind averages for the last three years by up to 30 percent. With the type of farm equipment we are now using, the entire county could be planted in about a week, give or take a day. With a few good days of planting a great dent should be made in the half of the corn acres not yet planted. What we really need is a greatly decreased wind speed. The wind is making it hard to apply fertilizer and chemicals and making it just plain hard to see. The wind is also creating a very dry soil surface and wet zones underneath. There are a few soybeans planted in the county as well as corn, but the number of acres is very minimal. In general, we say there is no penalty for late planting in corn until we get into May. The penalty is very small until May 4, and then we begin to lose a half percent of yield a day. Soybeans can be planted through May with little yield loss. One of the premiere web sites for agricultural economics information is the Extension "farmdoc" site. The URL is http://www.farmdoc.uiuc.edu. This URL is a little different than one I gave before, but the old one will refer you to the new. A couple of things buried in the site that are of interest this time of year are machinery cost estimates and crop production costs. Keep in mind that these are not custom rates. Custom rates are not published by the University of Illinois. Custom rates are actually surveys of people that do work on a custom basis. The U of I has only put out the estimated cost of operations for as long as I can remember. These figures are also what it is estimated to cost for the power, machine, fuel and labor. No management charge is built in. Many are interested in what the increase in diesel fuel price will do to the rates. Gary Schnitkey at the U of I says the impact will be in cents per acre at current fuel prices. Another area of interest this time of year is crop budgets. Check out the budgets in the management area of farm.doc. With the estimated costs of producing corn this year, total costs are estimated to be about $2.68 per bushel with average input costs and 160-bushel corn yields. Compare this to the current cash price of around $1.80 or the loan rate of $1.95 and you can readily see that additional yield or income is needed to break even (this does include a land cost of $145 per acre). Don’t plan on making up for corn shortfalls on the soybean side. The estimated break-even price for soybeans is $6.71 per bushel (calculating $115 for land rent or equivalent). Compare this to around $4 per bushel for harvest delivery or the $5.41 loan rate and we are still a little short. Where is the difference made up? For some it is in reduced costs, for others additional farm program payments help, and for still others there is some erosion in machinery equity. At any rate, current prices don’t offer a cash bonanza for local farmers. 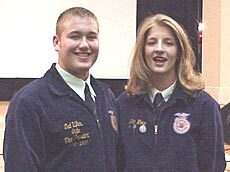 [APRIL 11, 2001] Hartem FFA members recently took part in Agricultural Legislative Awareness Day in Springfield. Nick Alberts, Kyle Hoerbert, Matthew Wrage, Kory Leesman and Brittney Kavanaugh assisted FFA members from around the state in distributing agricultural commodity baskets and lunches to all the legislators. These members also got to visit with Director of Agriculture Joe Hampton and their state representative, John Turner. Also, FFA member Anthony Jones was selected to serve as an honorary page in the House of Representatives. To finish the day, these members toured the Illinois Vietnam and Korean War Memorials, plus Lincoln's tomb. 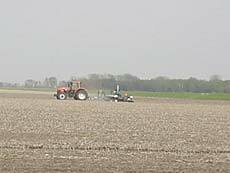 [APRIL 9, 2001] When we think of agriculture in Logan County and the central Illinois area in general, we think of corn, soybeans, beef cattle and hogs. All of those enterprises do exist, and in large numbers. Some of the other enterprises help with farm income, provide for using extra labor and fill niches created by consumers. Logan County operators have U-pick strawberry operations, asparagus plantings, herbs, flowers, traditional garden produce, ostriches, emus, elk, Christmas trees, ornamentals and just about anything else you can think of. Why? Because there is a market, or they have created one. That is one of the toughest parts about alternative enterprises: marketing. It wouldn’t be called alternative if existing markets were available to sell your produce. Some of the strategies to sell alternative items are direct marketing, contract production, grower cooperatives, buyer cooperatives and wholesaling where some type of market does exist. Wholesaling is generally a last option since producer profits tend to shrink with each marketing partner, but there is safety in being able to sell at least some of the produce. Many producers in alternative enterprises have to "blaze their own trail." Each one has to find out where a potential market exists and then produce for that market. Many of these enterprises also are done on a small scale because they are labor intensive. Think for a moment of picking 20 acres of strawberries or hand-cutting 40 acres of flowers or herbs. A tenth of an acre is plenty for many of these enterprises when you start out, but research must be done. Existing research done by third-party groups (such as colleges and universities) may be hard to come by. That leaves producers trying to find others who have had experience or possibly adapting information from other areas of the country or overseas. Risk comfort level and the entrepreneurial spirit have a lot to do with checking out alternative ag enterprises. If the tolerance for risk is low or you want a ready-made market, many of the options (or possible cash incentives) disappear. The newest trend among traditional producers is to produce something that is already grown but has added value. For example, premiums are available for certain types of soybeans that require only slight modifications in management. An extra 20 cents per bushel may worth using a special herbicide, storing the crop separately and delivering the crop to a certain location. Most commonly this is a type of contract production with a contract between a producer and a processor or local elevator. The downside that we have already seen is that when several producers are willing to produce the special crop, the premiums tend to decrease. University of Illinois Extension in Logan County has been involved in value-added corn and soybean plots for the last three years, and I will do some follow-up work later this year with the soybean plots in place this year. We also conducted a major producer survey last summer dealing with value-added crops and had producer meetings this winter. Alternative enterprises aren’t for everyone. They can be a good option if the people interested are able to "blaze their own trail." [APRIL 5, 2001] Kate Wrage was named the state winner in the Fruit/Vegetable category at the recent Proficiency Awards Day judging. After progressing through an interview, along with a review of her record books, Kate was selected the state winner and will now represent Illinois at the national FFA’s regional competition. Daniel Eeten, also of the Hartem FFA, was chosen as the runner-up in Diversified Crop Production.